Costing little more than the One Day Water Park Combo Ticket, the LEGOLAND Florida Water Park Combo Unlimited Ticket gives you 2 days of access to LEGOLAND Florida and LEGOLAND Florida Water Park within a 14 day period. LEGOLAND Water Park features a wave pool, Build-A-Raft lazy river, tube slides, body slides and interactive play areas, all with a unique LEGO theme! LEGO Wave Pool – Families can catch a gentle wave or simply cool off in this perfectly sized wave pool where the waves are just big enough for all ages to enjoy. Splash Out – The thrill seekers of the family can ascend to the tallest point of the water park attraction and choose from one of three unique slides, then speed down a 60-foot drop and “splash out” into the water below. Joker Soaker - A fun, interactive playground with various lengths, heights and types of slides that offer something different for every member of the family. Guests can wade in the surrounding pool and be surprised with a torrential spill from a 300-gallon bucket. Build-A-Raft River - Families can imagine, design and build a unique LEGO vessel and set afloat on a maiden voyage around the 1000-foot-long lazy river, set amongst playful LEGO Friends, flowering vegetation and palm trees. DUPLO® Splash Safari – Toddlers will rule at this water play area with shorter slides and interactive, larger-than-life DUPLO creatures. Highlights at LEGOLAND Florida include Miniland USA where you can see some of America’s most fascinating cities like you’ve never seen them before! Or perhaps visit the Driving School, a “real-life” driving experience for children ages 6 through 13, where kids receive their official LEGOLAND Florida driver license. Looking for something a bit more exhilarating? Try The Dragon roller coaster or LEGO TECHNIC® Test Track where you race a life-size LEGO TECHNIC vehicle along a wild roller coaster track. LEGOLAND Water Park is open from 9 March-2 September and daily except Tuesdays and Wednesdays between 3 September and 27 October. This ticket cannot be used at any other time as the water park will be closed. This ticket is valid for 2 non-consecutive days within a 14-day period, so you don't have to visit LEGOLAND® Florida on consecutive days. Tickets are open-dated ticket that can be redeemed at any time on your holiday when the parks are open. Children 0-2 years are free of charge and do not need a ticket. 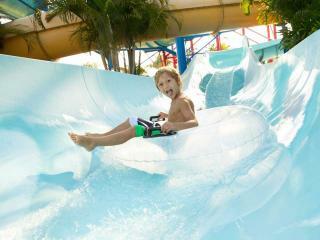 LEGOLAND® Florida Resort is located forty minutes south west of Orlando in Winter Haven. Attractions or entertainment may change operating hours, close due to refurbishing, capacity, weather, or special events, and may otherwise change or be discontinued without notice and without liability.